The biggest questions surrounding The Wolfpack – a documentary about 6 brothers who’ve grown up in near total isolation with movies as their only window to the outside world – are how did the director get access and is their incredible story true? Director Crystal Moselle provides answers in due time but also dives deeper into the astounding, cloistered world of these bright siblings to uncover years of mistreatment, inventive coping methods, the resilience of the human spirit, and people’s capacity for change. It’s fascinating and utterly enthralling, and The Wolfpack proves to be powerfully and deeply human. It’s a movie about kids who love movies and who emulate their made-up worlds, and what happens when they take their first tentative steps into reality. Shot over a a handful of years in the first half of this decade, Moselle focusses on the Angulo family – specifically the 6 brothers who ranged in age from 11-18 when shooting began. Their names (Bhagavan, Govinda, Jagadisa, Krsna, Mukunda & Narayana) were influenced by the Hare Krishna faith, which their parents Oscar and Susanne follow (or once did). They all live together, along with a younger sister, in a cramped Lower East Side apartment in downtown Manhattan. Home schooled by their mother and supported by subsidiaries and welfare, the family rarely, if ever, leaves the apartment (with one brother stating that some years they left a handful of times and other years not at all), with patriarch Oscar going out for occasional food runs. The enigmatic and delusional Oscar seems to harbour an overly paranoid worldview and his intense fear and distrust of society (and how it may affect his family) has led him to seclude them all. As Oscar’s influence poisons their minds, the boys are forced to watch the busy world go by their window. It’s heartbreaking and terrifying, like a form of extreme agoraphobia that’s strictly enforced. The boy’s only respite comes in the form of copious movies – over 5000 of them that they watch endlessly. The movies become their porthole into the outside world. Quentin Tarantino’s Pulp Fiction, Christopher Nolan’s Batman-trilogy, and numerous horror films are among their favourites. And with these as their only stimulus, they eventually start transcribing the films, making charmingly homemade costumes (that are seriously inventive and impressive), and re-enacting them on home video. These sequences provide some much needed levity and show off the boy’s spirit and charm as Moselle illustrates the rather dire conditions under which they’ve lived for years. With waist-length hair and often sporting Ray Bans and ill-fitting suits, the brothers look like a cross between a feral Wolfpack (hence the movie’s title) and the criminals immortalized in Reservoir Dogs. But rather than being allowed to run free and howl at the moon, they’ve been confined for years. And while they make the most of their circumstances (growing strong fraternal bonds, with much in-fighting alluded to), their unnatural youths mean they spent an inordinate amount of time living in their own heads. Resentment, curiousity and rebellion begin to fester until one brother makes the bold choice to escape. And he does it wearing a homemade Mike Myers mask from Halloween. As subjects, the Angulos are articulate and thoughtful. The movie rarely bother to distinguish between them and instead presents them as essentially a unified whole (although it becomes easier to pick out their different traits and personalities as the film goes on). Their senstive mother Suzanne proves to be just as much of a prisoner as the children, as Oscar holds their fates in an iron grip. But as the brothers come of age their subservience gives way to defiance, and the movie charts their thrilling and exhilarating steps into the real world. 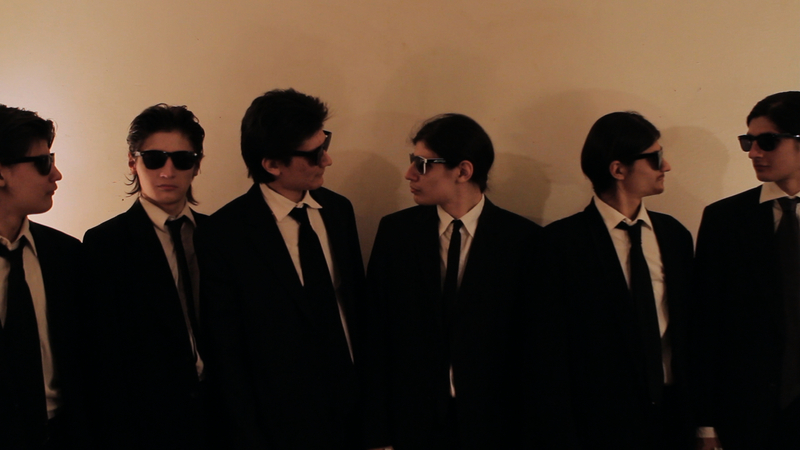 There are scenes in The Wolfpack that have such impact that they hit with the force of a sledgehammer. To be drawn into their world in such an intimate way and then to be afforded a small gasp of freedom rivals the end of Shawshank Redemption or the best summer day in terms of unabashed emotion. Moselle may hold back key information (which may leave viewers with more questions than answers at the end), but she nails the big moments. In fact, much of the film is comprised of early home videos and footage that the brothers shot themselves, so they too have agency and input in the telling of their own story. And what a story it is. The Wolfpack proves that movies can lift us up, carry us through dark times and inspire intense devotion (and warp your perspective: one brother expects all girls to break his heart because he’s seen that on-screen so often, while another sequence finds all the brothers certain they’re being followed in the streets of NY). It also illustrates the perils of dogmatic belief, and how a single parents’ limitless love can help, but not entirely offset, another’s poisonous influence. Inspiring debate and discussion, Moselle’s film shows the bonds of family and an extreme example of growing up into your own person. It’s also awkward and funny and sad and uplifting, and one hell of a movie.